Geoff Boycott, the former England opener, has said the ECB needs to schedule County Championship games during the course of a home Test series to enable national players to return to their counties and work on any weaknesses in the first-class format. Several England batsmen, including Kevin Pietersen, struggled for form during the recently-concluded Test series against Pakistan and Boycott claimed that was a major worry ahead of the Ashes. "The England players play so much international cricket that it's almost impossible to play any County Championship games in between matches," Boycott said on Cricinfo's fortnightly audio show Bowl at Boycs. 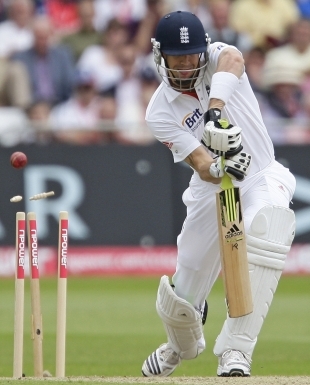 "Pietersen is one of England's players who plays everything. The fixtures for four-day matches in England are so badly arranged that the England players, even when they get a space between Test matches, they can't get matches with their counties, i.e four-day cricket matches. "They find that when there's a week off between Test matches, they find their counties are playing a 40-over match or a Twenty20, which is not ideal. It's not the best form of practice." Since the start of 2006, Pietersen has played just one non-England first-class match while Paul Collingwood, another batsman who's involved in all three formats, has represented Durham in just four four-day games. That pair averaged 23.33 and 19.83 respectively in the four Tests against Pakistan. Those few who have had an opportunity, Boycott said, have been able to show the benefits. "The only ones in the England team that can play County Championship fixtures are the guys who are not picked for the international ODIs," he said. "It's no coincidence that the two guys who played best for England in the series against Pakistan have been Jonathan Trott and wicketkeeper Matt Prior. "Now they didn't play in England's ODIs against Bangladesh and Australia, so there was a big period when they went back to their counties and batted well for them. They could take their time and play properly out in the middle. Many of the [other] England batsmen are playing poorly. It's a big worry for the Ashes." The solution, according to Boycott, was to schedule the Championship fixtures in between Tests where there was a reasonable gap. "There are periods when England play two Tests back-to-back, where you can't return to your counties. But there are periods when there are nine days before the next Test. So if they organise the fixtures in that period where all the nine counties play Championship matches, then any batsman or bowler who felt he needed more practice could go back and play a proper four-day match." England host India and Sri Lanka next summer but Boycott doubted the ECB would adopt a change in approach by giving precedence to first-class games over limited-overs. "They are so besotted, are the ECB, with making sure they have a four-to-six-week window to play Twenty20 cricket - about three matches a week for every county. It's difficult then to fit Championship matches in," he said. "They're only interested in making money through one-day cricket. They think they can make Twenty20 in England like the IPL in India and they can't. We have 60 million people in England but there are a billion people in India who're nuts about cricket. So there is a bigger catchment area in all the cities to watch. It's never going to happen [in England]."